This PDF 1.5 document has been generated by Microsoft® Word 2010, and has been sent on pdf-archive.com on 10/09/2017 at 17:24, from IP address 103.84.x.x. The current document download page has been viewed 122 times. File size: 424 KB (3 pages). The Gate diffusion Input is based on the use of a simple cell . transistors compared to traditional CMOS designs. for fast and low power circuits using less transistors. Gated Diffusion Input (GDI) technique. based in F1 and F2 functions. generality of gates in cell-based design techniques. only 2 transistors in case of GDI design. Analysis of Low Power 1-Bit CMOS full adder cells‖, IEEE Transaction on VLSI Systems, Vol. 10, Feb. 2002. CMOS digital design,‖ IEEE J. Solid-State Circuits, vol. 27, pp. logic design,&quot; IEEE J. Solid-State Circuits, vol. 31, no. 6, pp. Digital Signal Processing, vol. 49, no. 8, pp. 577-588, Aug. 2002. D. Radhakrishanan, S.R. Whitaker, G.K. Maki, Formal  L.
Int. J. of Electronics, Vol. 84, (6): 599-613, 1998. 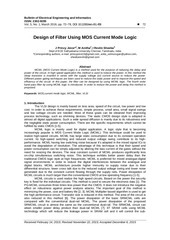 MOSFET threshold voltage‖, IEEE Journal of Solid-State Circuits, vol. D. Radhakrishanan, Low-voltage low-power CMOS full adder,in Proc. IEE Circuits Devices Syst., vol. 148, Feb. 2001. IEEE J. Solid- State Circuits,31(10): 1535-1546,1996.
and GDI technique with respect to different gates. less in the GDI technique compared to CMOS technique. The authors are thankful to Hon’able C – VI, Dr.
Pro-VC Amity University, Uttar Pradesh Lucknow, Wg. Cdr. B. Mohammad, ―A fully bypassed six-issue integer datapath and register file on the Itanium-2 microprocessor,‖ IEEE J. Solid-State Circuits, vol. 37, no. 11, pp. 1433–1430, Nov. 2002.
vol.41, no. 1, pp. 197–209, Jan. 2006. Dig. Tech. Papers, Feb. 2006, pp. 104–105. This file has been shared by a user of PDF Archive. Document ID: 00671549.